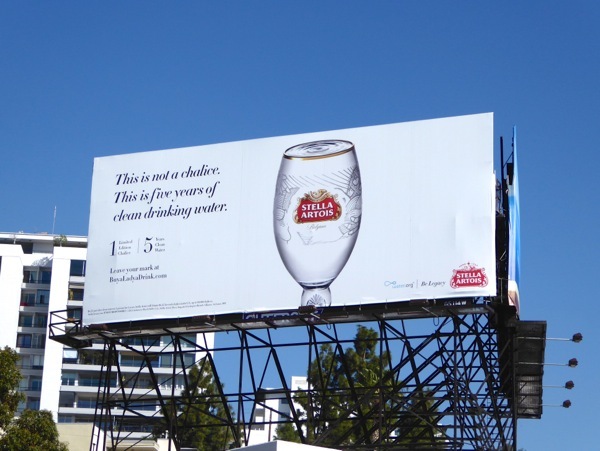 For years Stella Artois has been trying to convince us that their beer is worthy of being served in a chalice or display cabinet and not merely a glass, but now they want you to consider this chalice to be equivalent to five years of clean drinking water for a good cause. Now not only can you enjoy a refreshing beer, but at the same time you can Buy a Lady a Drink as part of their charitable initiative alongside Water.org to help provide essential clean water in developing countries for those in need. 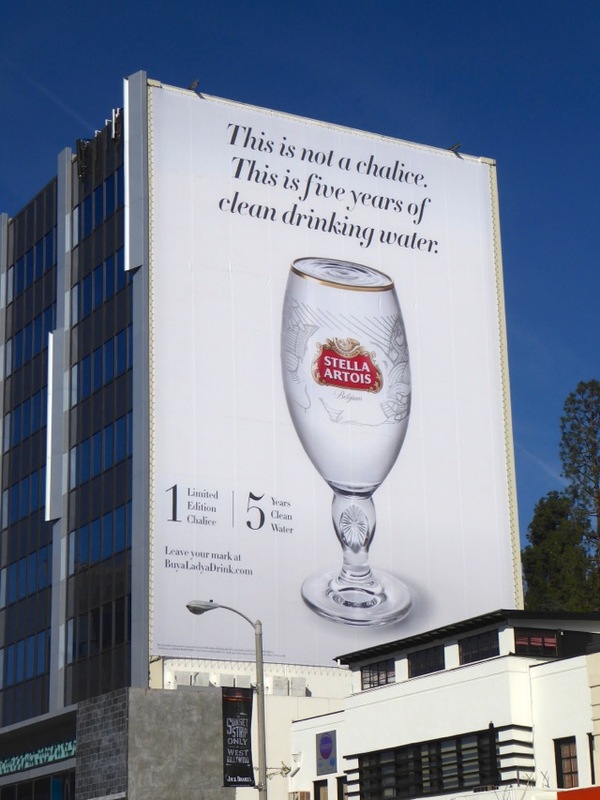 When you purchase a limited-edition Stella Artois chalice you'll help to provide five years of clean drinking water for a person in the developing world. 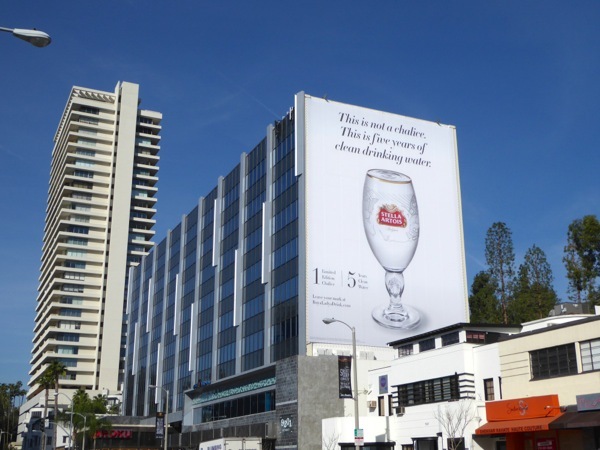 The giant-sized billboard supporting this latest Stella Artois outdoor ad campaign was snapped along the Sunset Strip in West Hollywod on February 12, whilst the standard landscape bulletin billboard was photographed along Santa Monica Boulevard on February 19, 2016. 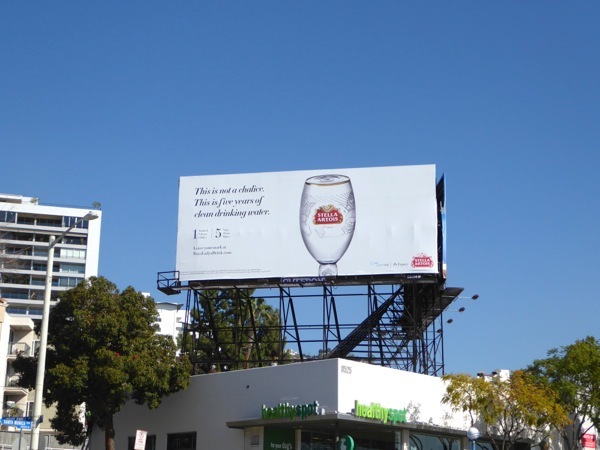 If you're a fan of the beer, be sure to check out all these other past Stella Artois billboards from recent years. 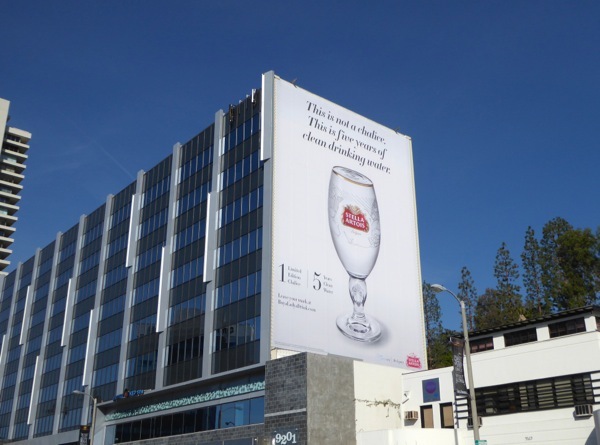 For other examples of a companies helping charities (and fostering goodwill with consumers and additional sales at the same time), be sure to also check out these Belvedere Vodka billboards which were part of the (Product) Red initiative to help combat AIDS in Africa and these Coca-Cola Arctic Home billboards which were designed to help save Polar Bears in their natural habitat. Here's your chance to start your weekend with a drink and the feel-good factor of having helped someone else at the same time.